A really quick and simple no bake dessert that's a perfect, cool and creamy dessert for hot summer days! 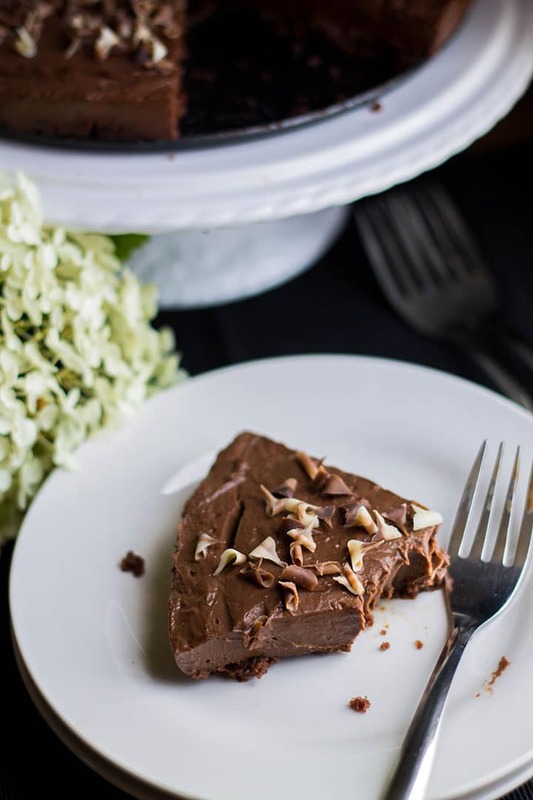 This easy, no bake, chocolate dessert recipe for Rich & Creamy Chocolate Torte is smooth, decadent and utterly delicious! This is really quick and simple no bake cake that’s a perfect, cool and creamy dessert for hot summer days! This recipe is the perfect example of how getting something wrong can turn out extraordinarily right! When you are developing a recipe, you can make things several times before you get it right. 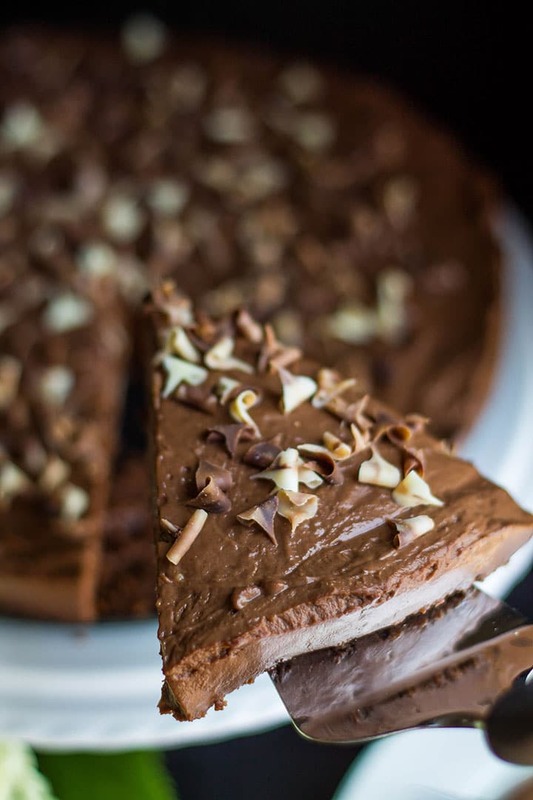 This recipe started out as a chocolate cheesecake, but it turned out way too chocolaty to be a cheese cake. There was too much chocolate flavor, and not nearly enough cream cheese. Who would of thought a recipe going wrong could taste so unbelievably good? 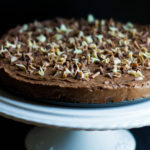 Using bittersweet chocolate instead of milk chocolate keeps the torte from being too sweet. 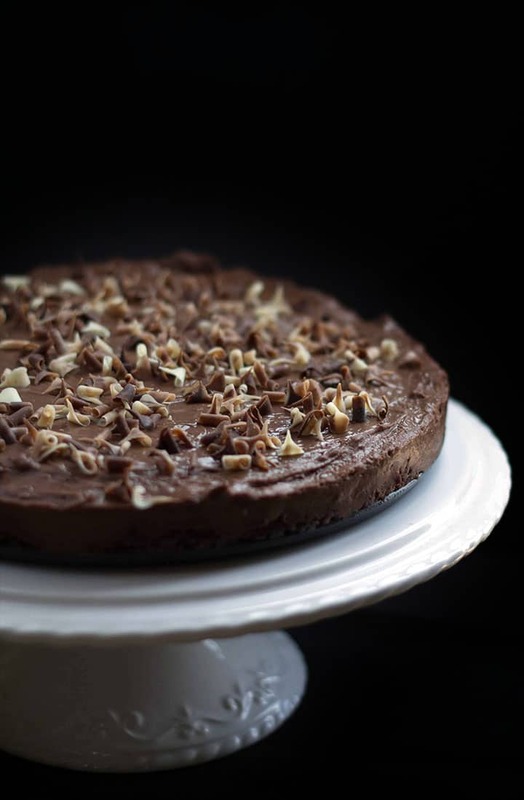 The sour cream adds a tangy flavor to the recipe that works really well with the chocolate creaminess of the torte. Using chocolate cookies instead of gram crackers for the base adds a deep chocolate flavor and crunch that brings it all together. 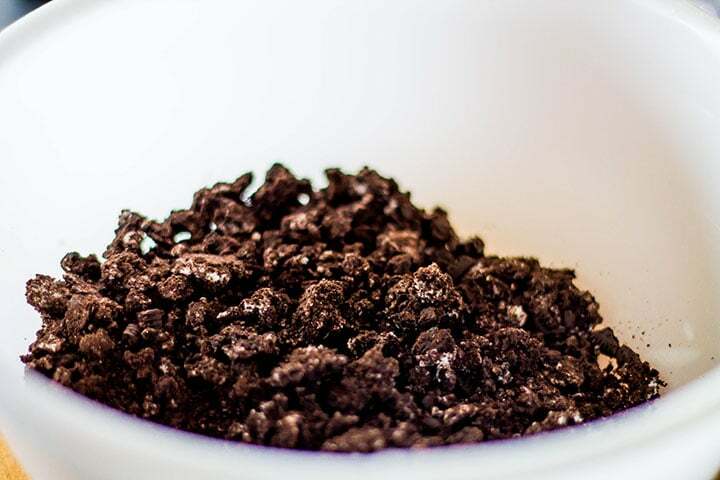 Break up the cookie crumbs and add them to a mixing bowl. Add the melted butter and vanilla extract, mix until well combined and press into bottom of a 9 inch sprig form pan. Mix milk, sugar, cocoa powder, cornstarch, egg yolks, sour cream, vanilla & salt in a food processor (or mixer) until thoroughly blended and the mixture is smooth with no lumps. Add the mixture to a large saucepan and bring to a simmer whisking the whole time. Once the mixture comes to a simmer, add the cream cheese, butter and chocolate. Whisk until smooth. Bring to a boil and whisk until the mixture becomes thick and creamy. 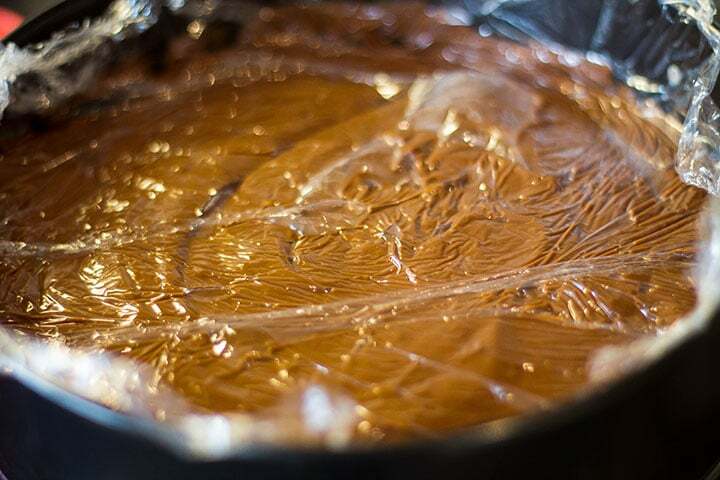 Pour the mixture into the pan with the base and cover with plastic wrap (make sure the plastic wrap is touching the surface to avoid a skin forming). 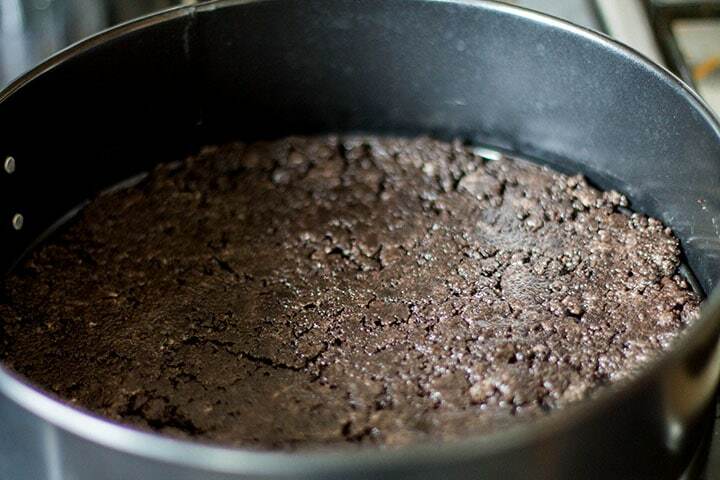 Chill cake for at least 4 hours. Then cover with chocolate curls for decoration. Be sure to heat the mixture slowly to avoid the eggs forming clumps. Make sure your cream cheese is at room temperature before starting. This is vital for a smooth, lump-free dessert. Don’t rush things. Be sure the torte is fully set before slicing. Try topping with a layer of freshly whipped cream before adding the chocolate curls. Once set, add a layer of sliced strawberries followed by a layer of whipped cream for a whole new dessert. Instead of chocolate curls, add chopped nuts for the topping. Mix the cookie crumbs and brown sugar in medium sized mixing bowl. Add melted butter and vanilla extract and mix until well combined. Press into bottom of a 9 inch sprig form pan and set aside.. 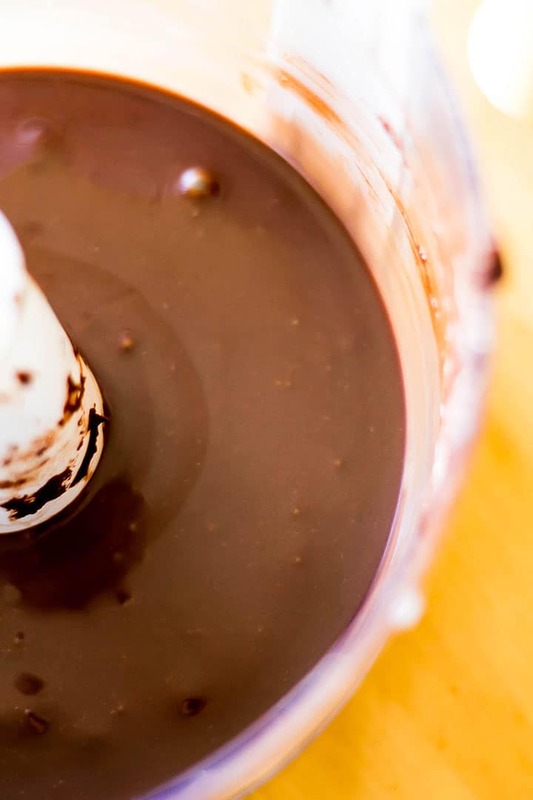 Mix the milk, sugar, cocoa powder, cornstarch, egg yolks, sour cream, vanilla & salt in a food processor (or mixer) until thoroughly blended and the mixture is smooth with no lumps. Add the mixture to a large saucepan and bring to a simmer whisking the whole time. Once the mixture comes to a simmer, add the cream cheese, butter and chocolate chips and whisk until smooth. 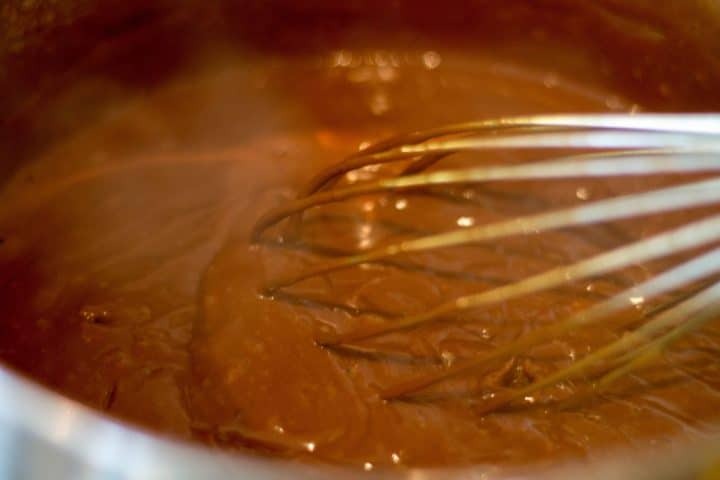 Bring the mixture to a boil and whisk for three minutes until the mixture becomes thick and creamy. Pour the mixture into the pan with the crust. Cover with plastic wrap (make sure the plastic wrap is touching the surface to avoid a skin forming). Update Notes: This post was originally published in July of 2014, but was republished with step by step instructions, new photos, and tips in May of 2018. The best mistake ever! The cake is divine, Erren! I love it when beautiful, unexpected results happen when cooking. 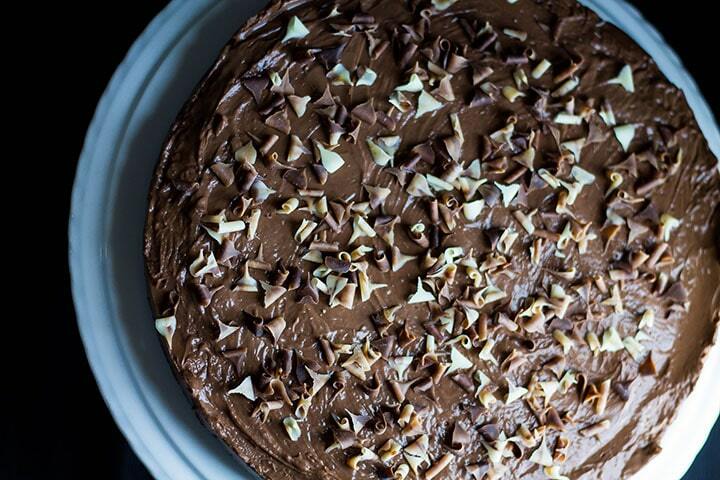 THIS is divine – so chocolatey, yummy and perfect. Hi, I made this for my Mom’s birthday and it came out great! Thanks so much for the recipe! I will definitely be trying more! So great to hear, Rose! Thanks for letting me know! Where’s the brown sugar you talk about in the instructions? Sorry Jan, the granulated sugar was meant to say brown sugar (not that either wouldn’t taste good). I fixed it now. Thanks for pointing it out!